"The Browser You Love to Hate" is Microsoft's latest attempt at humility, applying its self-deprecating, signature humor to yet another quirky ad campaign aimed to win back former users of their increasingly abandoned browser. "It's good now. No, really." seems to be Microsoft's mantra these days when discussing Internet Explorer while the advertising for IE has become somewhat apologetic to play on the sympathies of viewers. The website humiliates past IE versions as a way to keep IE9 far removed from past iterations with quotes like, "Some people are trying the new Internet Explorer and actually liking it. Not that they would say that out loud". Visitors will also find quirky images, social media testimonials and a humorous video (see below). 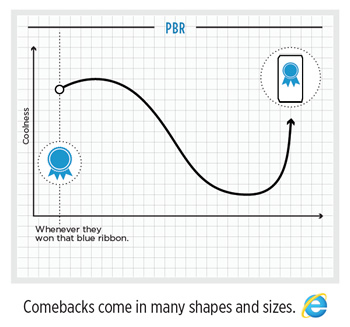 With the introduction of IE9 last year, Microsoft won much praise for finally getting it right. Despite everything that may be wholesome and good in IE9, Microsoft's share of the browser market has been steadily slipping as users defect to other browsers. In 2004, we reported almost 90 percent of webgoers were surfing with Internet Explorer. In recent times though, that number has dwindled to about 50 percent. Unsurprisingly, Chrome and Firefox have picked up most of those who have jumped ship. Oh, how times change. Internet Explorer 10 is just around the corner and a preview version has been available for some time. The browser boasts many improvements in terms of compatibility and speed. Microsoft has been aiming to keep IE a modern web browser instead of resting on their laurels like they did with IE8 and prior. Users can expect to see IE10 bundled with Windows 8 this fall, however, the final version of the browser will be limited to Windows 7 and 8 platforms only.